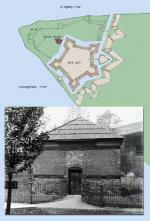 A redoubt or blockhouse was a small defensive work commonly built by eighteenth-century military engineers. This structure, the only surviving remnant of Fort Pitt and the oldest authenticated structure in western Pennsylvania, was also known as Bouquet's Blockhouse. It was built in 1764, after Pontiac's Rebellion, to serve as a powder magazine (for the storage of gunpowder) capable of resisting enemy assault and the flooding that periodically swamped the rest of Fort Pitt. Among the architectural highlights of this structure are its "loopholes", the horizontal slots built into its sides for firing muskets, and its pentagonal shape, which mimicked in miniature the design of Fort Pitt. The British ceased authorizing new construction at Fort Pitt after 1764. From then until the post's abandonment in 1772, only absolutely necessary maintenance was done, and it functioned chiefly as a market for the fur trade with the Indians. Charles M. Stotz, Outposts of the War for Empire: The French and English in Western Pennsylvania: Their Armies, Their Forts, Their People, 1749-1764 (Pittsburgh, PA: University of Pittsburgh Press), 1985. Louis M. Waddell and Bruce D. Bomberger, The French and Indian War in Pennsylvania: Fortification and Struggle During the War for Empire (Harrisburg, PA: Pennsylvania Historical and Museum Commission), 1996.